New Jersey recently became the 14th state to approve an effective medical marijuana law. There are actually 31 states plus the District of Columbia that have medical marijuana laws recognizing the medical benefits but most are not generally recognized because they rely on the national government to provide or authorize a legal supply of marijuana. Some advocacy groups recognize Maryland as a 15th state because they have what the Marijuana Policy Project calls a “working law” which lets patients obtain a recommendation from a doctor but only protects patients from jail time and not fines. Many peoples knowledge of medical marijuana laws are incorrectly based on California’s law which have the most lenient patient requirements and access in the country. Those suffering from conditions or symptoms such as depression, anxiety, insomnia or migraines would not be allowed access in other medical marijuana states despite marijuana’s value in treating those conditions. Only 3 states, other than California, allow the setup of dispensaries to distribute marijuana to patients. 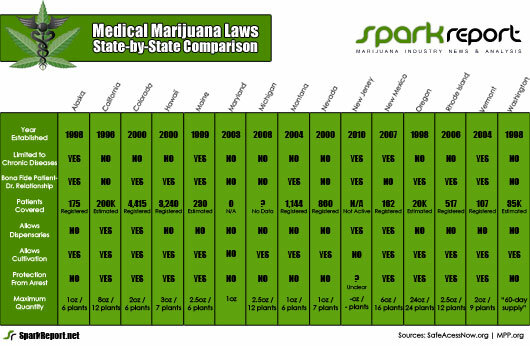 The infographic below was designed to show the differences in laws for the 15 states with effective or working medical marijuana laws. The information outlined was collected to show patient requirements and coverage as well as safe access to obtaining and using the marijuana. More information on each specific value is included below. 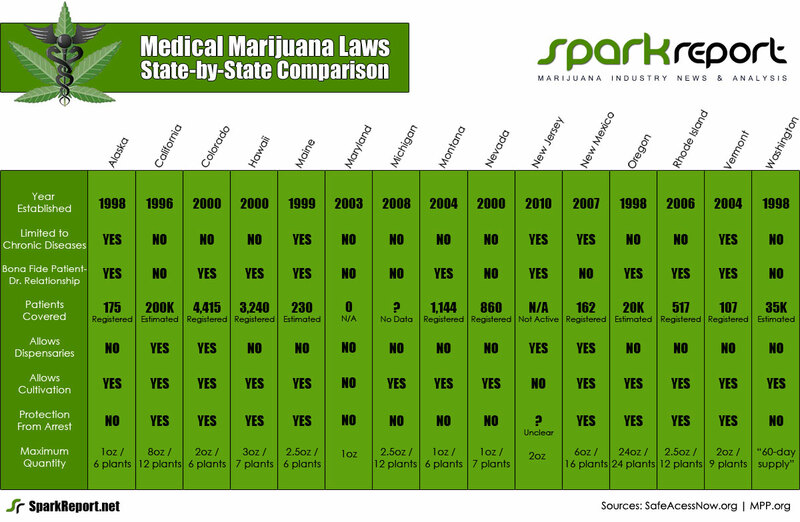 The year each states medical marijuana law was put into effect. New Jersey’s law will go into effect later this year. Although most laws are aimed to only allow whats called “chronic or debilitating” illnesses, some states use the wording “other medical conditions” which leaves a window for doctors to decide if marijuana is an appropriate medication for any specific patient. Other states strictly require patients to have a chronic disease such as cancer, AIDS or multiple sclerosis. Many states require that a doctor or physician recommending medical marijuana has an established relationship with the patient. This relationship sometimes requires a doctor to have treated the specific patient for a required amount of time prior to recommending medical marijuana. Some states, like California, allow any doctor to recommend medical marijuana regardless of their knowledge of the patients medical history which has led to a medical marijuana industry of doctors whose job is only to write medical marijuana recommendations. Most states require patients to apply and register for a medical marijuana program in the state. For states that do not have a registry or have a voluntary registry, like California, these numbers are estimated by using information provided the Marijuana Policy Project. No state currently allows medical pharmacies to distribute medical marijuana but some allow for non-profit dispensaries to be established to provide patients with safe access. Some states do not specifically address dispensaries or growing collectives (a group of patients sharing one common growing location) and defers patients to consult with local law enforcement agencies. Americans for Safe Access encourages patients in these states to instead pressure state agencies to specifically allow dispensaries so owners are not put at risk of arrest and imprisonment due to vagueness of the law. Almost all medical marijuana states allow patients or their care givers to legally grow their own supply of marijuana. Ironically the “Garden State” of New Jersey is the first of the 14 generally recognized states that does not allow patients to grow their own marijuana. The goal of each states medical marijuana law is to protect patients and doctors from state laws against possession or cultivation of marijuana. Some states do not specifically protect patients from being arrested by law enforcement and instead leave it up to the court system to decide if a patient or doctor was within their legal right to have medical marijuana. The maximum quantity of harvested and growing plants as defined in the state law. Some states, like California, have varying maximum quantities due to differences in county laws. Other states set a maximum number of “mature plants” each patient or caregiver can have. Patients and caregivers should always refer to their respective city and county laws before going by whats defined in the state law (or this infograph). You’ll have to update the California section because as of yesterday (1/21/10) there AIN’T NO LIMITS to the maximum number of plants or marijuana allowed!